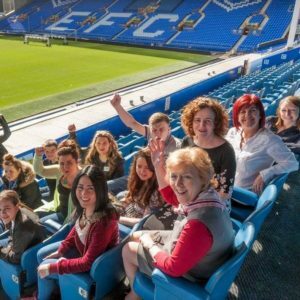 Kinship carers enjoy family day out to Everton FC stadium, Goodison Park. Pic © Kinship Carers Facebook. A week of activities has been held to celebrate the work of kinship carers, allowing families to raise awareness of an important issue. Kinship care is when a family member or close friend step in to look after a child who can no longer live with their parents due to death, imprisonment or addiction. The number of children going into care is rising, and so councils across the country are struggling to cope with all the youngsters in need of support. In turn, foster families are becoming increasingly sought after, leading Kinship Care Liverpool to draw up plans to shed light on the work of their charity. Pauline Thornley, Kinship Care project manager, told JMU Journalism: “Since 2016, there has been a 46% increase of kinship placements. Without those families the local authority would collapse. Kinship Carers Liverpool have been playing host to a range of events this week, including galas, high tea and a kin-kids party. National Fostering Week is a related celebration, but many people don’t know what kinship care is and workers in Liverpool created their own celebratory week three years ago.